Today’s post is about the best golf club sets for kids. My brother’s son was very interested in golf and always would ask me if he could hit some balls with my clubs. I let him use some of my old junkers but they were obviously too big for him. So for his birthday this year I got him Intech’s Junior golf club set. This kid has been a golfing fiend ever since. I am amazed at how fast his swing is improving…kind of makes me jealous because he figured out some subtleties that took me years to figure out. 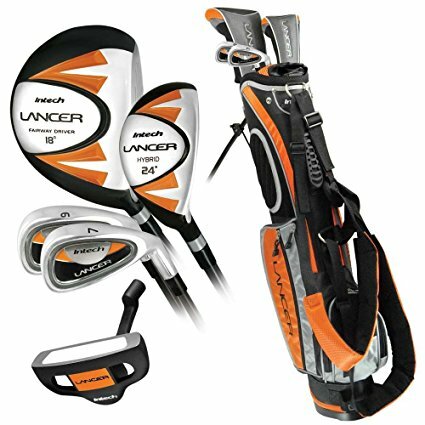 If you want to buy this junior clubs set, you can get it pretty cheap here. It’s a cheap (inexpensive) golf club set for kids – great entry point to the game. Comes with a back weighted putter which is good for children to learn to put on. Set comes with a bag stand. 10 piece golf set – a total of 5 golf clubs I believe. Can be purchased in left or right handed. Teach him/her to swing before you hand these off. Kids tend to like to swing things like golf clubs very wildly so it’s important that they know that these clubs can hurt/damage things. My brother told me the first day his son had these clubs he managed to break one lamp and one drinking glass. All in all, the Intech Lancer Junior set is great for kids aged 3-12. This golf club set can also be purchased in different sizes to fit different sized/aged children. I also recommend that you spend no more than $90-$100 on your child’s junior golf set as they outgrow these things very fast. You can only expect them to be able to use them for a year or two max before they completely outgrow it.